SAN FRANCISCO, Sept. 9, 2016 /PRNewswire/ -- On August 17th, Inc. magazine unveiled their 35th annual list of America's fastest-growing private companies—the Inc. 5000. After a three-year sales growth of 266%, San Francisco Salt Company has become America's Fastest Growing Salt Company, ranking 1439 on the 2016 Inc. 5000 list. This recognition solidifies San Francisco Salt Company as one of the most successful and fastest growing companies within the independent small business market. "The Inc. 5000 list stands out where it really counts," says Eric Schurenberg, Inc. president and editor-In-chief. "It honors real achievement by a founder or a team of them. No one makes the Inc. 5000 without building something great – usually from scratch. That's one of the hardest things to do in business, as every company founder knows. But without it, free enterprise fails." 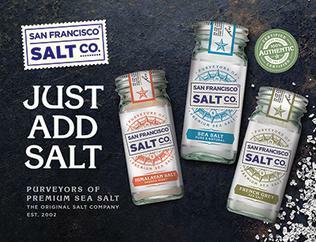 The San Francisco Salt Company was established almost 15 years ago, as a small operation in the San Francisco Bay Area. The company has grown to become one of the largest suppliers of specialty gourmet salts in the United States, as well as a trusted leader in the Epsom Salt industry with their extensive line of Epsoak Epsom Salts. The assortment of gourmet sea salts and bath & spa salt products offered by the company are an example of their efforts to be at the forefront of the ever-burgeoning sea salt movement. With a team-driven culture focused on delivering best-in-class customer satisfaction, the San Francisco Salt Company is poised to continue taking their salt game to the next level. "It's a great honor for the company I started in 2002 to be recognized by Inc.," says Lee Williamson, president of San Francisco Salt Company. "My dream has always been to make San Francisco Salt Company a household name, and this achievement is proof that my amazing team and I are finally on our way to making that happen. Our gorgeous new retail rebranding is garnering us more attention than ever, and elevating us to an even better position for explosive growth. We're extremely excited for 2016 and beyond."